You’ll get the most advanced treatment: We’re at the forefront of orthopedics and provide unparalleled care. Dr. Kevin Stone has spent 25 years pioneering and refining minimally-invasive, biologic orthopedic treatments. He holds more than 40 U.S. patents on novel inventions to improve healthcare. Patients travel from around the world to experience the kind of care that we can offer. You’ll benefit from biologics: Our biologic surgical techniques work with your own tissues to deliver the best results. We replace worn out tissues with new natural ones, so to permit a return to full activities. You’ll preserve your joints: We want to preserve the natural biology of your joint whenever possible. We repair and regenerate when possible and replace with metal and plastic only when necessary. You’ll be reassured by our outcome studies: We keep long-term track of our patients and our outcomes are excellent. Studies show that over a decade later even patients with arthritis benefit from cartilage replacement. 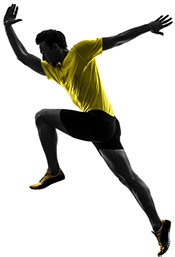 Even our higher level athletes have returned to impact sports after a meniscus replacement. You’re guaranteed an elite surgical team: There is no B-team here. Dr. Stone is assisted in surgery by his nurse practitioner, Ann Walgenbach. They have operated together for over 20 years. Working alongside them is a skilled anesthesia team leader for their last 4,000 cases. Our surgeon is the best of the best. You’ll gain from our experience with pro athletes: We’ve learned from the pros and we’ve worked with countless athletes from many sports. Dr. Stone has served as physician for various sports organizations including the US Ski Team, the United States Olympic Training Center, the Smuin Ballet and athletes of all ages. You can DO something NOW: You don’t have to live with your pain and wait until it’s time for a joint replacement. You’ll continue the activities you love: Our patients, including pro athletes, often return to their pre-injury level of sport. You can too. You’ll be you. Only Better: We don’t settle for just getting you back on your feet. Our goal is get you back fitter, faster and stronger™ than you were before you got hurt. Your insurance will typically cover much of the surgical expense: Our office team is here to help. Most of our patients have at least a portion of their care covered by insurance. You can learn from our previous patients: Our patients are always keen to talk about their experience. You’ll find dozens of their recordings online. You’ll avoid arthritis: Injury-related osteoarthritis is not something you have to grin and bear. It is a fixable condition. Our tissue-engineering procedures treat cartilage damage to prevent or repair the cause of arthritic wear. You’ll become a smarter athlete: Your injury is an opportunity to learn about the mechanics of your body, optimize your nutrition, build your strength and work on your mental attitude so you’ll return to sport stronger and smarter. You’ll be seen as a whole person: You’re more than just an “injury” to us. We take a holistic approach to healing joints, including onsite physical therapy and mind, body, and spirit advice. You’ll be listened to: Talk to us. What you notice about your body helps us. We can address your concerns. You’ll never be in the dark: We always take the time to explain things carefully, without jargon and without patronizing. We are available on line daily. You’ll have a one-stop shop: No more bouncing from place to place. We’re set up to handle every step of your care from diagnosis, to outpatient surgery (if you need it), to onsite physical therapy. You’ll get instant imaging: Your MRI and digital x-ray images are taken onsite and are available immediately, read by Dr. Stone and a world-class musculoskeletal radiology team, greatly reducing the delay between examination and diagnosis. You’ll benefit from our passion: We’re a group of professionals with a shared philosophy. You’ll find that each one of us brings something unique to your treatment, with a common thread: our passion for our biologic field and our dedication to our patients. You’ll receive joined-up care: As a team, we’ll carefully coordinate your comprehensive treatment program, here and when you return home, and we’ll tailor it to fit your lifestyle and activity goals. You’ll have world-class physical therapy: We believe in the benefits of immediate pre and post op physical therapy and offer extensive manual therapy and soft-tissue mobilization. Our onsite physical therapists work with the surgical team to provide a complete view of an injury with treatment continued into a full body fitness program. You’ll learn to see yourself as an athlete in training, not a patient in rehab: Our patients speed their recovery with the attitude of a professional athlete in training. You’ll share responsibility for your recovery: Naturally, you expect a lot from us but we expect a lot from you too. Strike a bargain with us; we’ll give our best effort surgically including post-surgery advice and physical therapy resources and you dedicate yourself to making all those tools work well so you can achieve your goals. You can come to work out in our gym: If you’re local, we invite you to be here. You can drink your fill of Joint Juice and Protein: While here at the Clinic, feel free to grab a Joint Juice or two, loaded with glucosamine and chondroitin, supplements that are great for joints, and Premier protein shakes and bars.